Most of the South East Asian flights connect Indonesia. Choose any airlines but AirAsia. (I was sleepless throughout the journey. There is no leg space and you cannot incline your seats either. Low cost carriers do have this disadvantage). 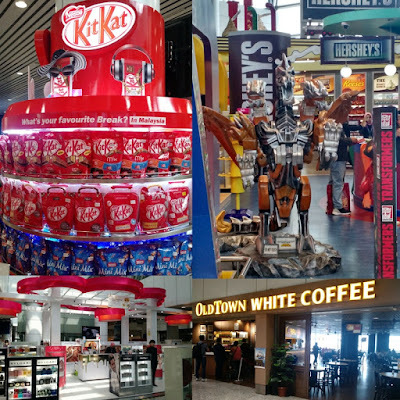 Since the journey is long, you can go for full service carriers which include food and other in-flight amenities. Our toward journey was in Air Asia and return in Air Malindo. I could easily judge the difference in the service and quality. Contact your service carrier for good deals on flights. Ours was from Makemytrip. Check for the number of stoppages. Direct flights would generally be costlier. Air Asia halt was at Kualampur Airport for three hours till the next connecting flight. Tip: Allow yourself ample sleep in flight or at connecting airport so that you reach your destination fresh and energetic. Air Asia flight had left me sleepless. I could not sleep at Kualampur Airport either. 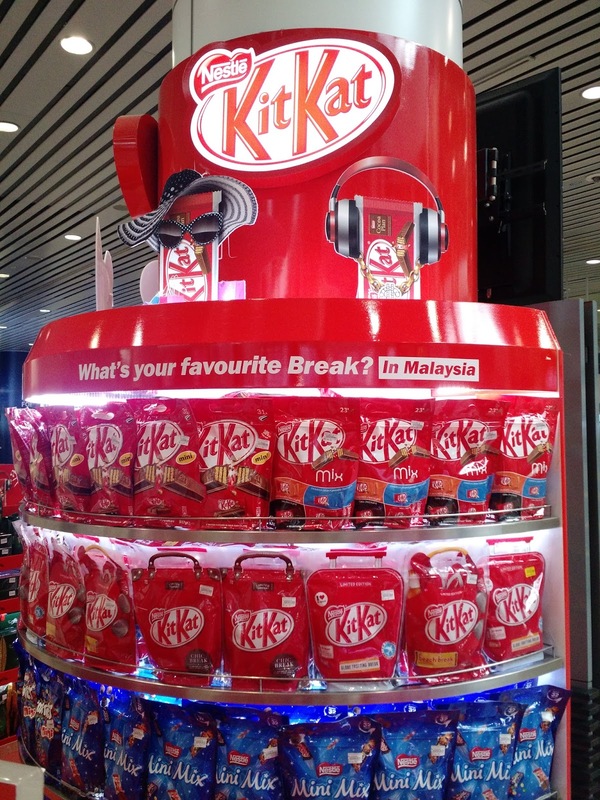 So a sleep deprived me took a walk inside KL airport to kill time. 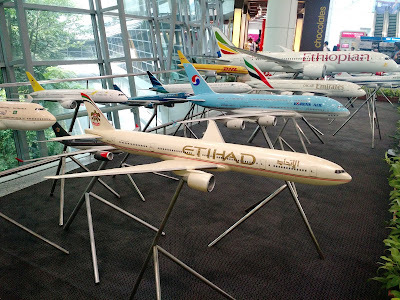 It is advisable to read the same on the websites of your respective airlines so that you do not get last minute surprises.Also, travel light and leave some space in your luggage for souvenirs that you might want to shop in Bali. 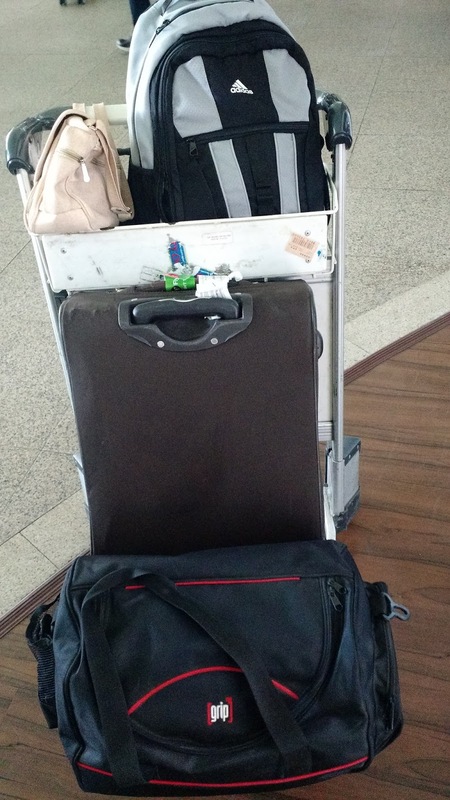 Keep your essentials, documents, camera etc in your hand baggage or carry on luggage. Things like batteries, body lotions, medicines need to go in your cabin luggage. Check the airlines website mentioning the list of items that you can carry in respective baggage. Keep an extra luggage lock and secure your cabin bag before handing over to airlines for luggage boarding. The lock of our cabin bag was tampered with which we discovered later. Thankfully a backup lock saved us from any loss. For Indian citizens, no visa is required. Pretty easy for Indians you see! For people from other countries please check http://www.visabali.com/tourist-visas.php. Rules keep changing so please keep an eye on the updates. You can buy a sim from anywhere in Bali which comes pre-loaded with data. You might have to further recharge the sim for calling value. Primarily you would require data to navigate maps, so make the best use of data. Buying a sim at the airport might be expensive. 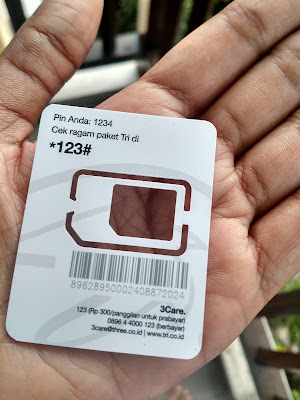 We bought 3 Care sim from a shop close to our hotel which costed us 30000 IDR. Indonesian Currency is called Indonesian Rupee often abbreviated IDR is valued much lesser than Indian Rupee. One Indian Rupee is equivalent to 210 IDR. Makes you feel rich? Now look at the dollar conversion. 1 USD is 13659 IDR. Its a standard norm to convert Indian Rupees in Dollars. Do that in India instead of going to exchange counters at Bali airport. Remember, exchange rates in dollars are offered at higher prices at airports. 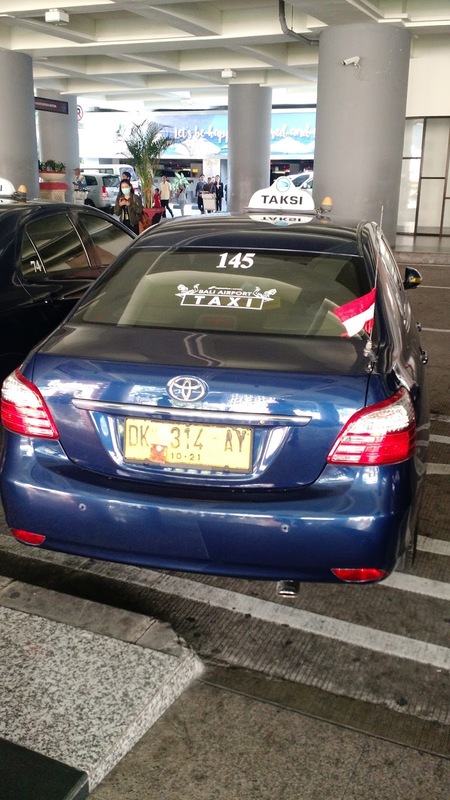 At the airport, it is advisable to convert a smaller amount of dollars to Indonesian Rupee (IDR), so that your taxi fare is at-least sorted. For the rest of the amount, exchange $ to IDR from any authorized money exchange. Go for the ones which are big and authentic. Stay away from small shacks or shops. Chances are you might be duped. 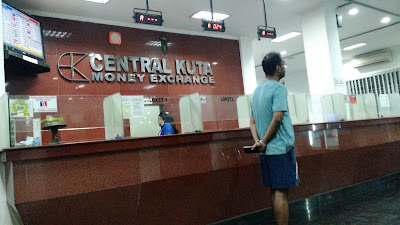 We exchanged from Central Kuta Money Exchange which was in the lane behind our hotel. Download UBER app in your phone and use it freely to commute there, especially when you land in Bali and heading to your hotel. Taxis at airports charge exorbitantly. For instance Bali airport taxi charged us 150,000 IDR (More than Rs 700) to drop us to our hotel in Kuta. Whereas Uber charged 30000 IDR (Rs 142) for the same distance from hotel to airport. Never skip insurance while traveling international because you do not want to spend heftily on foreign land should you face ANY medical condition. Contact your insurance agent or buy online in a single click. Insurance also covers the loss of luggage, theft or certain emergencies. We bought ours from ICICI Lombard. Just provide your date of travel, flight tickets, purpose of visit and visa or hotel info, and the policy would reach you in your mail box. Its that simple. For Bali which is a humid place and you can be prone to diseases/insect bites in forests, travel insurance is a must. 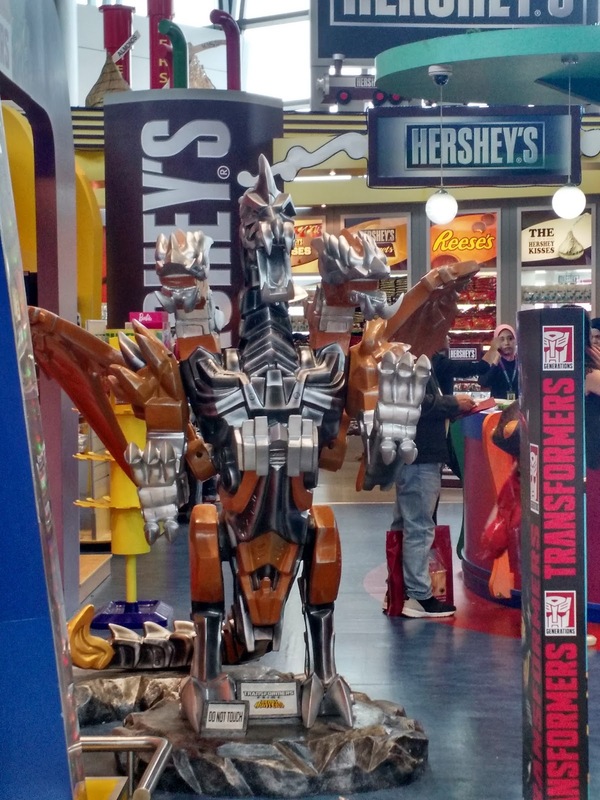 Tourists are often carried away by stories of fake valour. For instance an acquaintance told me that International Driving Licence is not required in Bali and Indian DL would suffice. Please do not fall for the trap. Cops in Bali are strict and in case you break any traffic rule or face any unforeseen contingency, the first thing they would ask for is an International Driver’s License and the failure to produce the same may lead to huge penalty or even criminal case. You can apply for one in your local/district court at a nominal cost. It would be valid for 1 year from the date of preparation. We prepared ours from Gurugram District Court at Rs 1200. Yes a little nagging and sweating in queue is required, but after all it’s for your own convenience. Once you have all documents ready, carry photocopies with you and keep them handy. Bali has narrow but good roads minus the potholes. 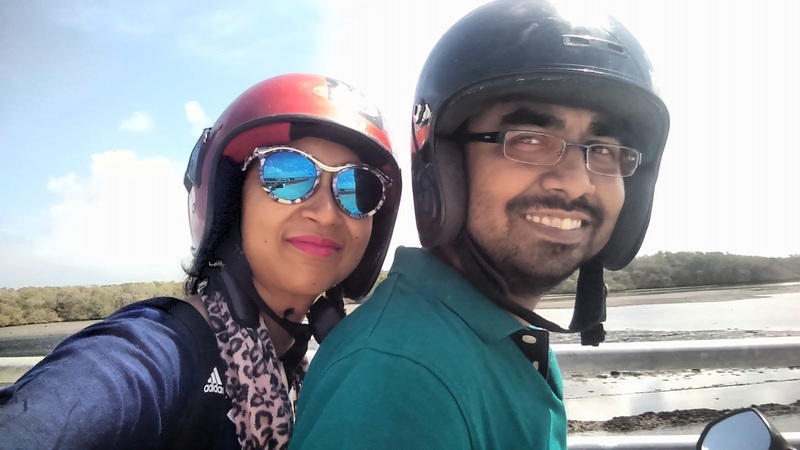 Just like one would cruise through Goa on scooters/bikes, follow the same here. Hire a scooters for two reasons- One they rarely get stuck in traffic and two, are cheaper than taxi/Uber for long distance ride. Watch out for scooter renting shops near your hotel or ask your hotel reception for help. Check the bike's condition before you pay, especially tyre pressure, pickup, seats, headlight and most important, the documents. Take a trial ride before you close the deal. The scooter would be given to you with little petrol, enough to ride to the nearest petrol station. (Petrol is called Pertamina in Indonesian language). Petrol is quite cheap here. (One litre costed 7500 IDR or Rs 35 only). Make the most of your scooter ride. We rented a scooter at 50,000 IDR per day ( Barely 230 INR) from a tiny scooter rent shack at Kuta. Always keep your international DL, insurance and bike documents with you handy. Indians are used to jump traffic lights, over speed or honk unnecessarily. Try doing these in Bali and a cop would be waiting for you at the next traffic signal. Irrespective Bali is a smaller place and economically weaker than India, traffic rules are strictly adhered to. We had stopped at a traffic signal few inches after the crossing line and retracted the bike as we realized our mistake. Inspite of undoing the wrong, a traffic cop chased us and fined us with 300000 IDR. Phew! It was one hell of an experience on foreign soil. Needless to mention, helmets are a must for both the riders. Do not over speed and do not argue with the cops. Its better to be safe than sorry. Yeah? Bali is dominated by non vegetarian cuisines, especially sea food and pork. Vegetarians do face problem in eating out. If you don't even eat eggs, then you would surely have a tough time. However you can ask the restaurant to make vegetarian rice or noodles for you sans meat or fish sauce and they would happily do that for you. 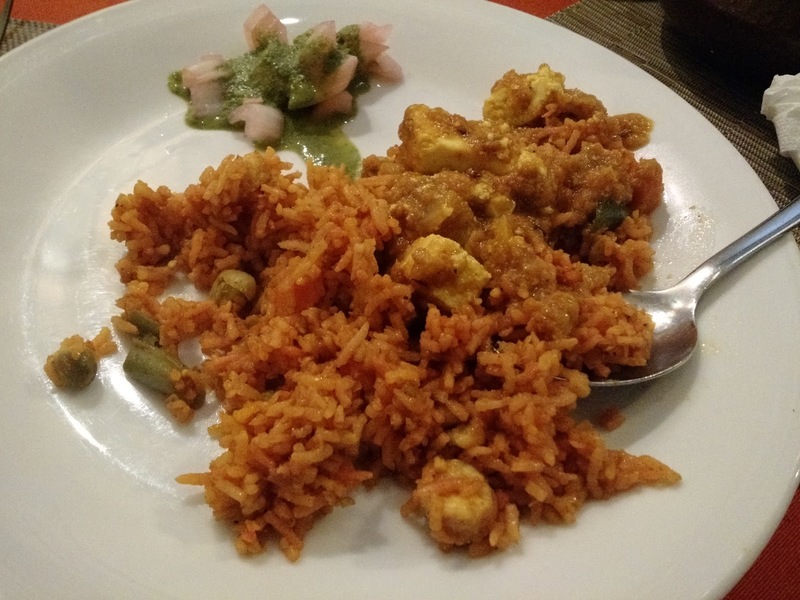 Nasi Goreng (stir fried rice) is available almost everywhere which you can customize while placing order. Our favorite place to eat out was "Gateway of India" in Kuta. Anyway fruits and bread are always available everywhere which is a huge respite for vegetarians and vegans. Talking about Vegan food, yes there are a few vegan restaurants in Bali (which was surprising to us). You can look for them in Zomato. 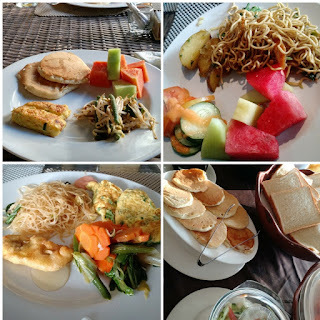 We ate in a vegan restaurant in Ubud. (Going towards Ubud Palace, the restaurant would be on your left). In case the smell or sight of anything non veg is unbearable, then you can always carry ready to eat meals or noodles in your luggage. Though that may not suffice for more than two-three days, it would be something better than nothing. Bali has a tropical climate all year and has moderate temperature. The beaches enjoy breezy weather and pleasant sunshine. Maximum temperature reaches up to 30-32 degree Celsius. Carry comfy cottons, light airy casuals, beach wear and comfortable footwear. You would need flat slippers or floaters most of the times. These tips and experiences are from my trip to Bali in August 2017. Live, love, laugh and be a travel addict! By the way, this post made it to the Indiblogger home page in the popular blog list. When words fail you and you feel the adrenaline gush while watching the army parade, that's when you are at Wagah Border, Amritsar, facing our rival neighbor Pakistan. This visit was the first for husband after he fretted and frowned over not being at Wagah even once. YouTube has endless videos of the ceremony, yet it is a different feeling to witness the same in person. The event, named beating retreat ceremony, takes place every day in the evening, when the gates of two counties India and Pakistan are opened and the flags are lowered. Prior to lowering the flags, security personnel from both sides march to the gate, thumping their feet, showing their aggression and pride for the country. Higher the foot in the air, louder are the cheers. This military practice takes place between Border Security Force (BSF) and Pakistani Rangers, amidst huge cheering crowd at both sides. 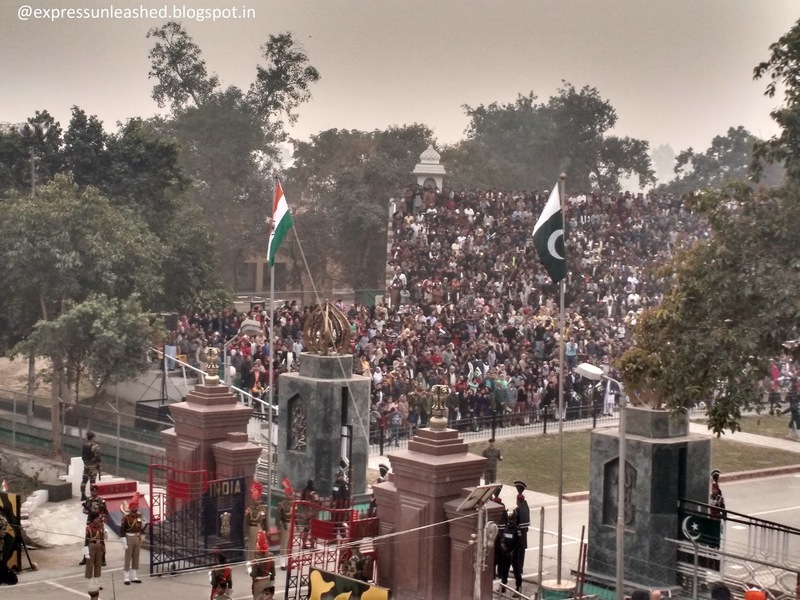 For the records, I had visited Wagah Border twice and each time I witnessed something new. This time (on the third visit) I witnessed new constructions, more seating capacity and of course longer queues. Reaching the venue is a huge task in itself. In case you do not have a pass, you are advised to reach the venue as early as 2 pm. If you have a pass issued by any Army "connection" of yours, you have to patiently wait for your pass number to be called out. Our pass number was called out around 3:15 and by the time we reached Attari Border, traffic turned out nightmare. You also have to pay toll in between before reaching border parking. It was quarter to four and we had not been able to park our car. Seemed an entire country was here to watch the beating retreat ceremony. Husband parked the car at a crammed up spot roadside, like thousand others had. We jumped into action and fled through the numerous VIP check points displaying our id cards and confirming our names on the list. The security personnel at Wagah work round the clock and managing crowds of thousands is not an easy job for sure. The least we can do is cooperate with them and not argue when they ask us to maintain discipline. The VIP pass is no guarantee of a fixed seat or closer view. That’s exactly what happened with us. By the time we entered the “amphitheatre”, the front seats were full. We got a place somewhere in the last few rows. The visibility of Indian parade was difficult and taking pictures was next to impossible from there. But the vantage point gave a good view of the Pakistan side. This is how we find positive things among negative. The show started with lady officers marching towards the gate followed by cultural programs, canine unit march and BSF soldiers’ parade. The show emcee, clad in white, encourages crowd to cheer up and give a tough competition to Pakistan. The decibel level reaches a new high with every hand signal of his. As the crowd goes berserk competing with hoots from Pakistan, you can feel the contagious energy gripping you. 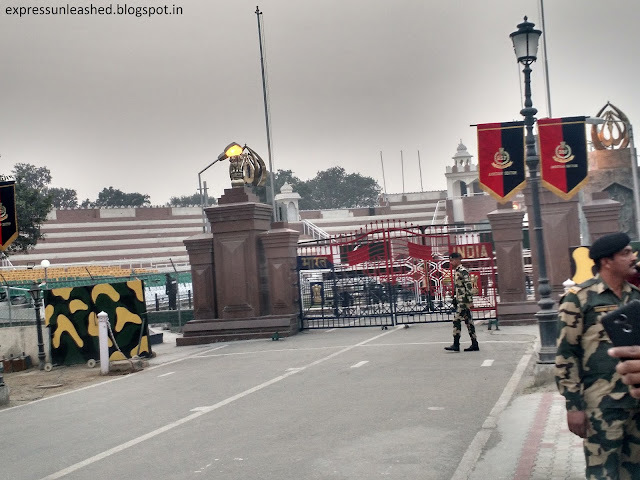 The soldiers march ahead, in perfect sync, saluting the national flag and standing tall with pride at the border gate. In come the BSF officers to face Pakistani Rangers raising their feet high in the air and thumping with full might. The thump is followed by caressing their mustache or adjusting their cap, with an air of smugness. The officers are supposed to show their aggressive side, also meant to warn the rival country what we are capable of. The “mess not with me” message shows in their eyes and body language. Meanwhile crowd from both sides cheer up with slogans praising their country. At sundown the flags are lowered, representing peace and harmony in spite of the conflict both the countries have. As the ceremony closed and the crowd prepared to leave, all my enthusiasm died seeing so much garbage left behind. Is all the patriotism only shown with slogans and cheering up for BSF? What happened to the basic civic sense? It is extremely sad and disturbing when the fellow country people behave so. All plastic and garbage littered by the crowd would be cleaned by the BSF admin staff. What’s patriotic about it? Keeping the security in mind, BSF security personnel ask people to leave ASAP. They did not let us contribute by cleaning up the staircase. It was against the protocol. It took us more time to leave than it had taken to arrive, as cars were stuck in over crowded streets. P.S- We visited Wagah Border on 31 Dec 2017. To reach Wagah- Take your own vehicle or hop in a public transport from Railway Station Road. -Handbags are not allowed to the venue. Keep them in your hotel or car. Phones and DSLR are allowed though. 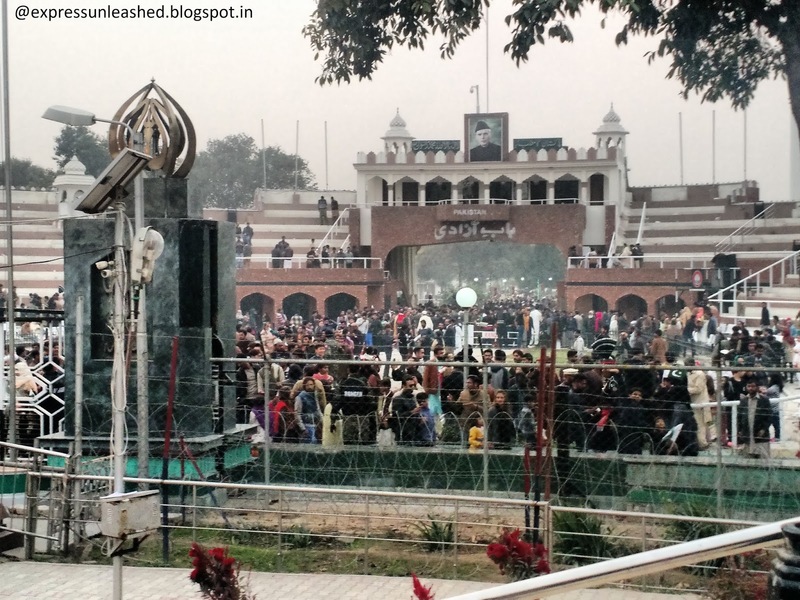 -Phone networks are jammed at Wagah for obvious reasons. Large groups should keep together. In case you get lost, it will be difficult to call anyone. -In case kids or family members get separated, you can make request for free announcements at dedicated booths. -Carry your own water bottles because bottles sold inside are expensive and unhygienic. Please trash them in dustbins. Littered place is a common sight there. Please refrain. -Let the traffic clear before you make your way back. The noise, pollution and warm weather can create lot of confusion, stress and temper. The return way is more confusing and not the same that you took while arriving. All you need is patience and keep calm. -Unbearable heat during summers can make your visit difficult here. Carry caps, hats, eye glasses, sufficient water and wear comfy cottons. By the way this post made it to the most popular list on Indiblogger home page. 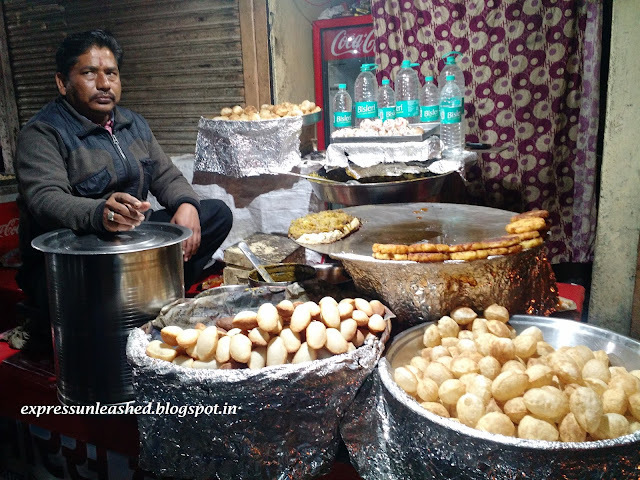 A peda wala in Mathura, selling pedas for daily living. 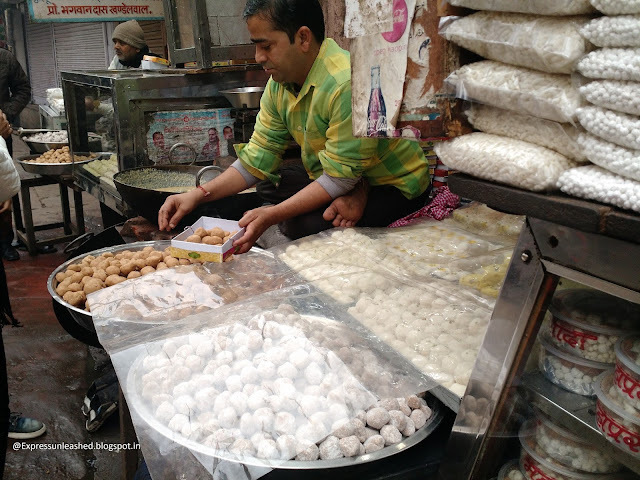 Peda is a soft milk based sweet, traditionally made with khoya, sugar and flavored spices. The brown ones are pure khoya which have shelf life of 2 weeks and the white ones (covered) have punch of cloves and they last for 2 months. Pedas from Mathura in Uttar Pradesh are the best in North India. 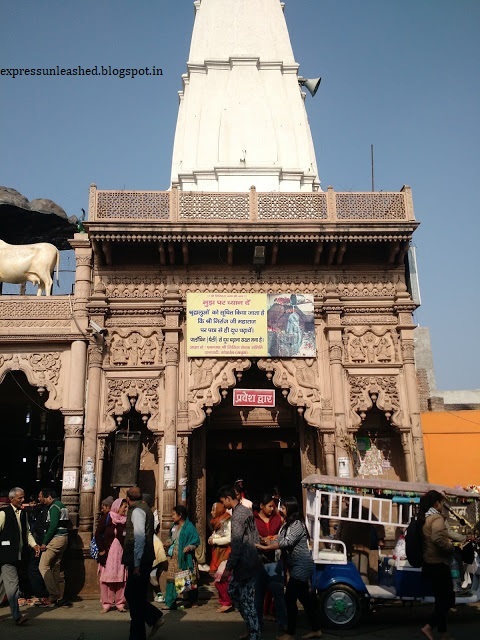 So what if Mathura has bad roads and a serious traffic problem; that could not dampen my spirits to see the holy town. 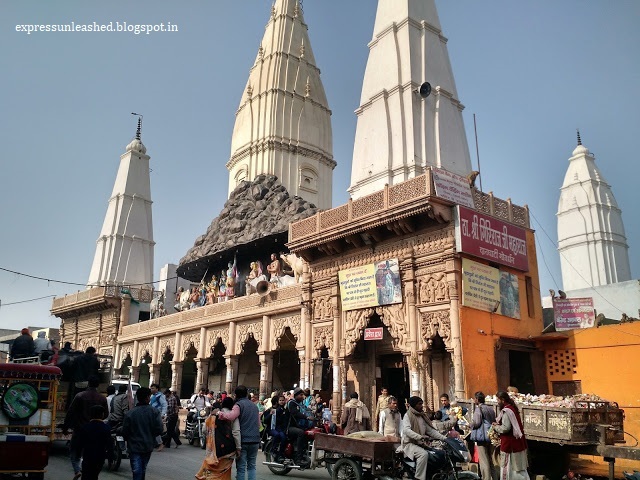 Mathura, the birthplace of Lord Krishna, holds high significance in the books of History and Mythology, drawing lot of tourists and devotees every day. 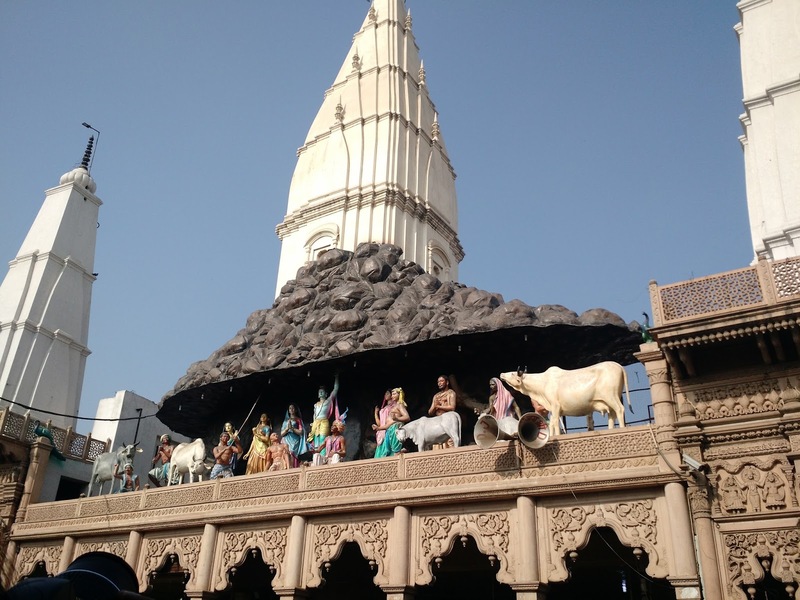 The first of my three day trip comprised visit to Govardhan Temple, Sri Krishna Janmbhoomi and market hopping. 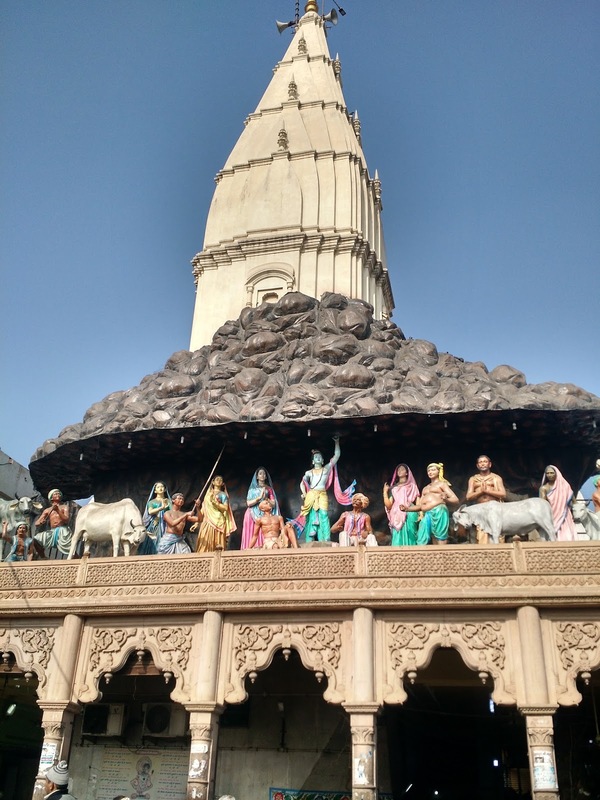 Read my post on Govardhan Temple here. I utilized the second half of the day in Sri Krishna Janambhoomi Temple. 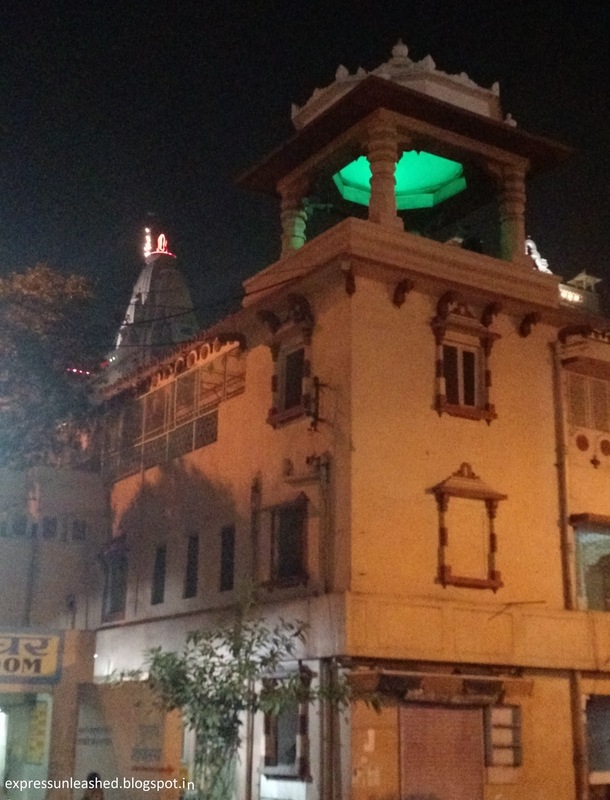 Sri Krishna Janambhoomi is the very spot where Lord Krishna was born to Vasudev and Devaki in Kansa’s captivity. The temple has parts of that historical jail, open for visitors. The huge temple premises is on a raised platform, which you can reach via a long flight of stairs. 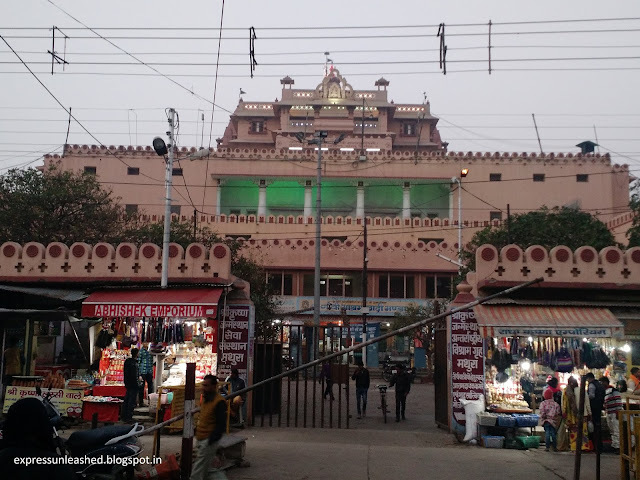 Heavily guarded by CISF, the temple has a mosque in its close proximity. 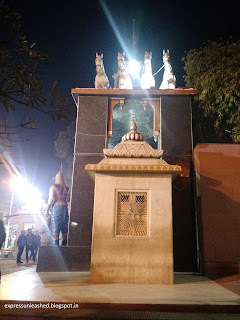 The main shrine of the temple is dedicated to Lord Krishna. The walls have beautiful paintings depicting the life of Krishna and his various avataars. Everything inside is extravagantly pretty and outstanding. Even the roof walls caught my attention where Krishna Leela was painted in vibrant colors. You can spend time meditating or singing bhajans at the main shrine. 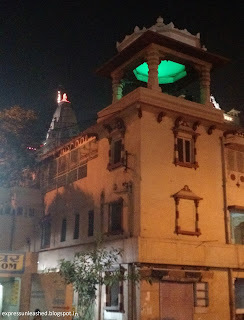 The first level of the temple has a prayer hall where the ISKON group sing and dance to Krishna Bhajans. The rhythm of the mridang and manjeera takes you to trans! You end up feeling elated and full of positive energy. The market within the temple complex boasts of sweets, colourful gifts, idols of God and lovely embroidery work on accessories. 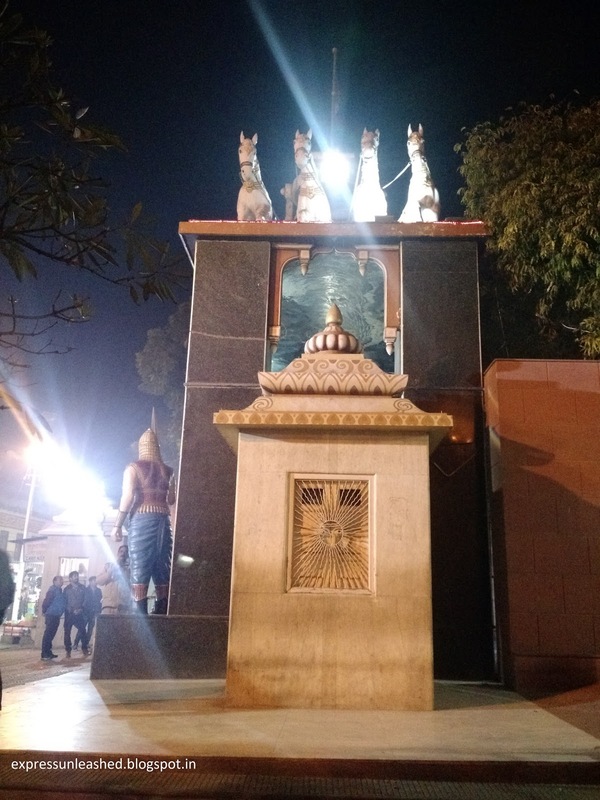 The most interesting and visit worthy place in the temple is the artificial cave that exhibits Krishna Leela at different stages of his life. The dark cave echoes with a combination of sound and light effects to compliment the atmos. -Photography and carrying bags is prohibited inside. Cloak rooms outside the premises charge Rs 2 per item to deposit your bags, cams and mobiles. -You would be frisked by security personnel twice. You cannot cheat them by hiding your mobile phones in your clothes. -Though the temple has not mentioned any dress code, it would be wise to dress modestly covering your bare legs at least. -Footwear is deposited at the shoe stand on ground floor for free. -Monkeys and dogs are found in large number. Do not bother them, they would not bother you. Do not feed any animal inside. -Temple opens at 6 am and shuts at 12 noon. Reopens at 4:30 pm till 8:30 pm. Plan your visit accordingly. 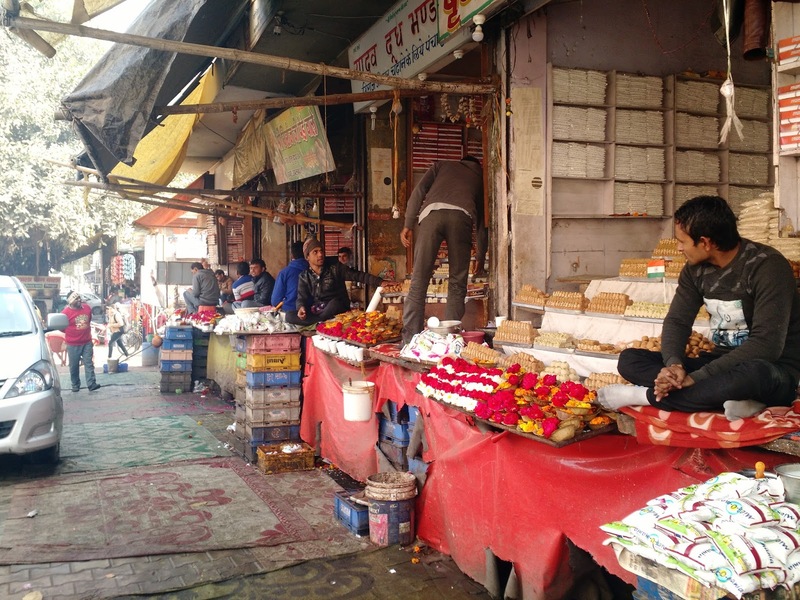 Outside the temple, do visit the local market. It turned out to be my best experience here. Needless to mention, my eternal bond with sweets, brought me here to have the best Peda of North India. The little brown sinfully indulgent pedas which melt in mouth make me feel they were made for me. 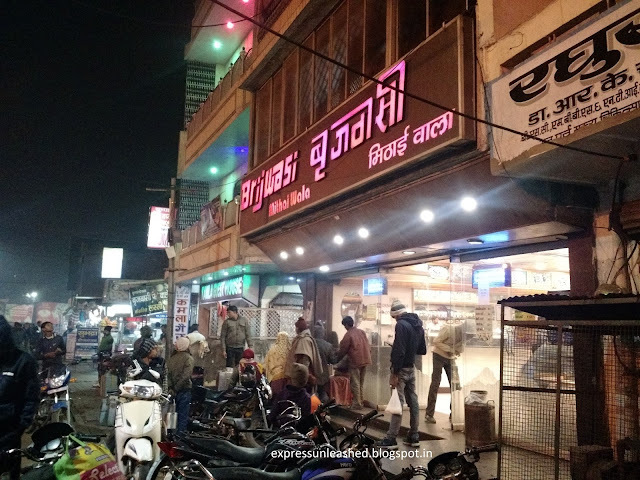 Infact every third shop I saw was named Brijwasi, one of the oldest sweet shop in Mathura. Leveraging the legacy, even the local vendors have renamed their shops to the same. 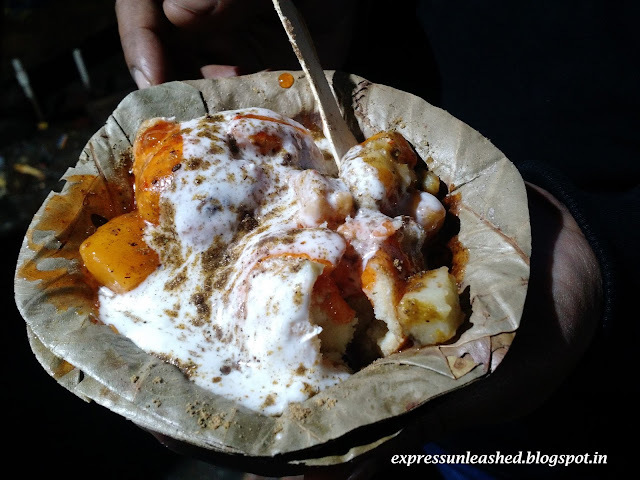 Stroll in the market for the best chaat and tikki. 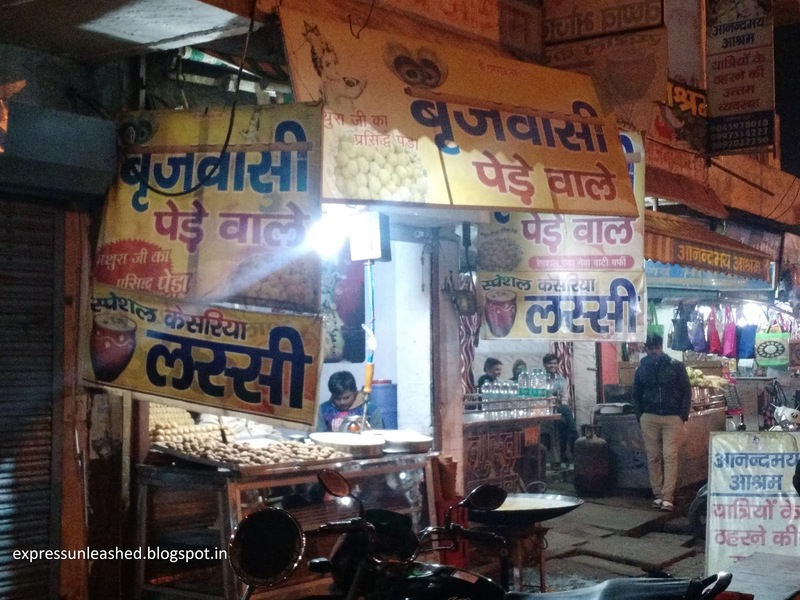 We had a plate of golgappa and dahi vada each at Rs 20 from Paras Chaat Bhandar. The gentleman is the most humble vendor I ever met. 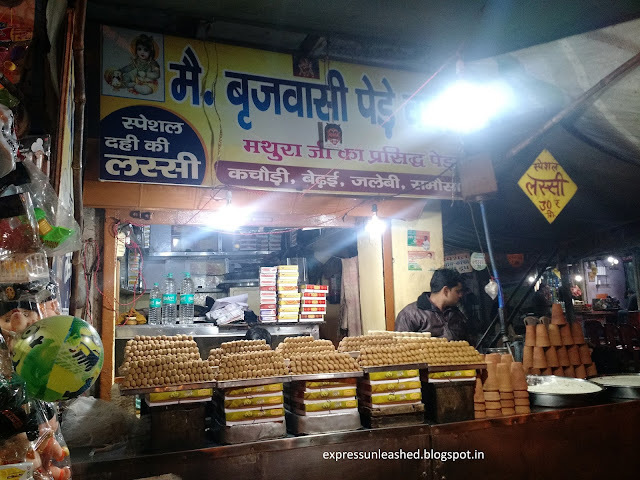 Do give his stall a try when around Krishna Janambhoomi. 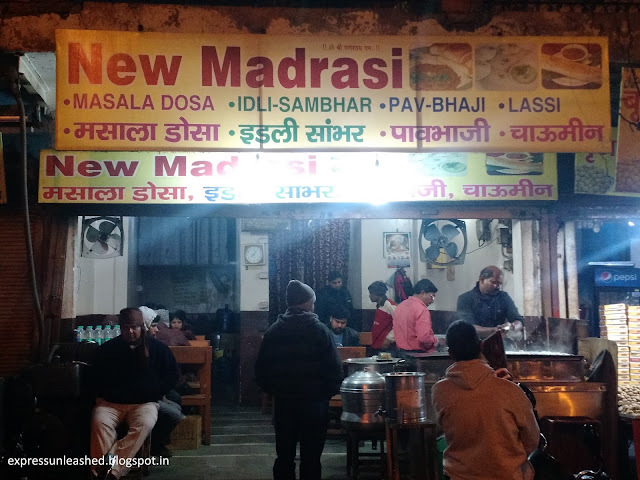 Our dinner was from a small eating joint named New Madrasi where we had rawa masala dosa at modest price of Rs 60 each. I ended up complimenting the owner how much I liked the dosa. 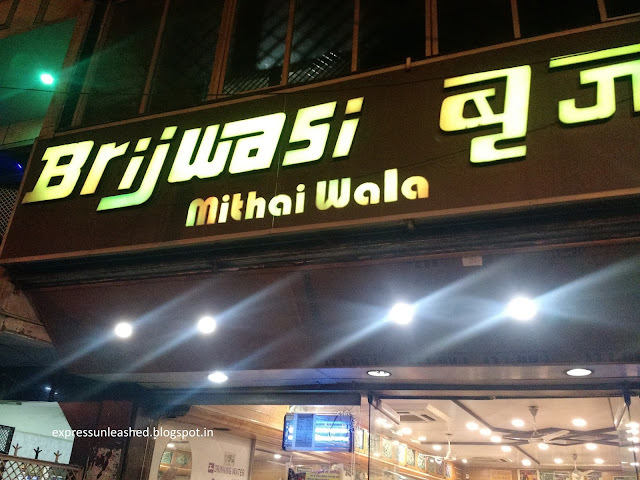 Around 8pm, we walked back from Sri Krishna Janambhoomi premises to our hotel (Ganpati Palace), which was less than one kilometer, and the streets had started to bear a deserted look. It is advisable to head back to to your hotel and avoid strolling on roads after 9 pm. Mathura and Delhi are 180 km apart. Take Noida Expressway for a smooth uninterrupted journey. The highway is good with thankfully no potholes or repair work. An alternate route via Palwal is a shorter distance but the journey would be uncomfortable and bumpy due to pathetic road condition. Trains are also available from various stations of Delhi till Mathura Junction and Mathura Cant. P.S- This trip of mine was in January 2018. Also, this post made to the top post on Indiblogger. Long weekends are like a drop of rain on barren lands, for the time pressed, working professionals dwelling in urban spaces. 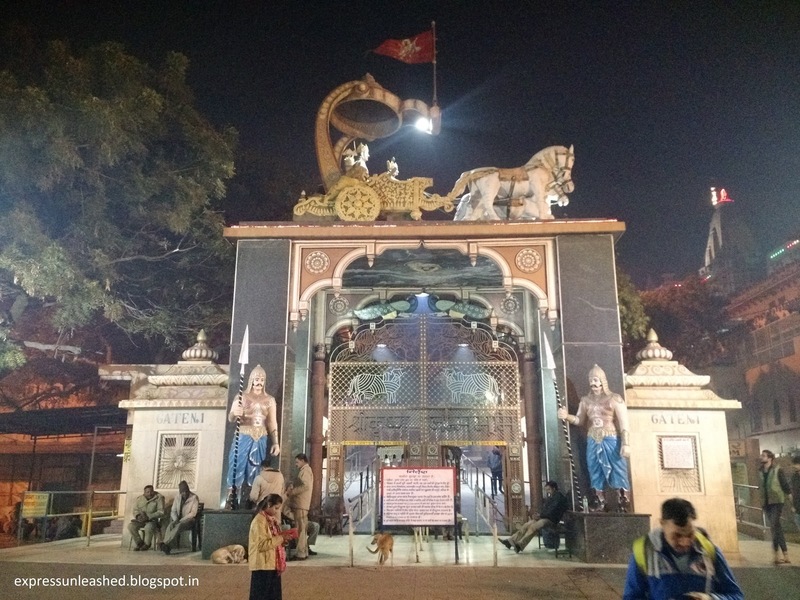 So husband and I planned a three day sightseeing of Mathura, Vrindavan and Bharatpur during the Republic Day holiday. Nothing much has changed in the birth place of Lord Krishna. The old town is pretty much the same, with narrow lanes, peda shops, cows, monkeys and lots of tourists. The day we reached Mathura, the hotel manager rather surprised us with the info that all temples close at twelve noon and reopen at four in the evening. I did not remember this practice from my previous visit in 2005. A little baffled and disappointed, since we had less time in hand, we proceeded towards the farthest temple- Daan Ghati Govardhan Temple. Where- 12 km from Hotel Ganpati Palace or IOC Petrol Pump. You can expect heavy traffic on the narrow roads any day. Road Condition- Not bad, not very good either. Unmarked speed breakers are a huge turn off. The narrow and half constructed roads don't need speed breakers any way! Needless to mention abrupt potholes. The road passes through little village settlements and vibrant farm lands, ending in a crammed up spot near the temple premises. The temple- When Lord Krishna lifted Govardhan Parvat on his little finger to protect the villagers from the flood havoc caused by Indra, Lord of thunder and rain. Daan Ghati temple is said to be built at the exact spot. The entire region is known for 21 km parikrama which starts from the temple, passes through Govardhan hills and kunds (lakes), several temples and ends at Daan Ghati. There are shorter routes for parikrama as well. You may not see any hilly region here. Perhaps the parvat or hill vanished with time or never existed. The temple is quite old, straight from the books of legends. You’d find Lord Krishna, Ram, Sita, and Lord Shiva idols inside the temple premises. Photography inside is prohibited. It is the exterior that tells the story. I managed a few shots in spite of heavy traffic outside the temple. Commercialization of the area is evident from the shops and establishments around. 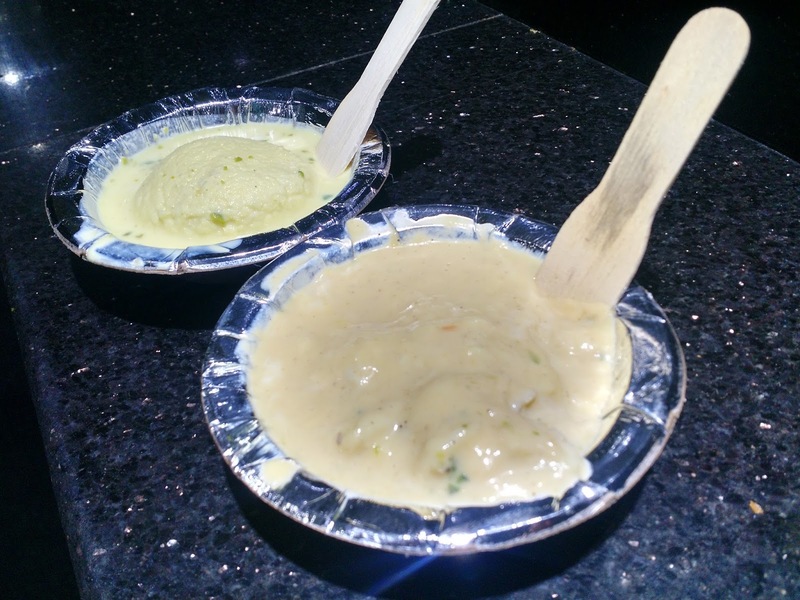 We ended our Govardhan darshan with rasmalai and rabri from a sweet shop nearby. 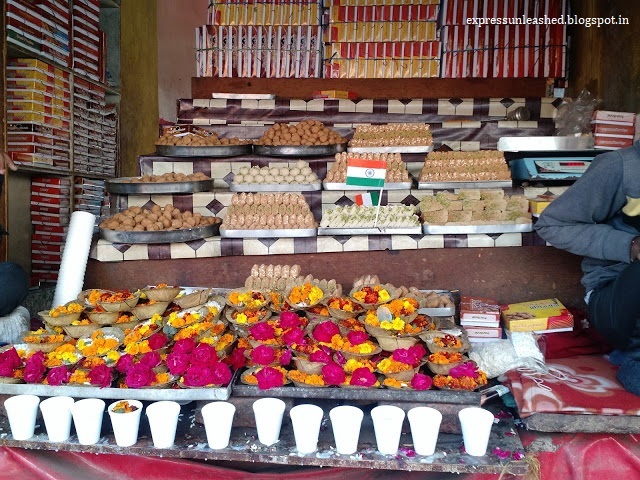 You can keep your footwear in any sweet shop opposite the temple in exchange for a prasad box at a nominal cost. Stay alert- Pickpockets and monkeys swarm the place. Temple Timing- 5:30 am to 11 am and 4 pm to 10 pm. Though you can do parikrama any time of the day. Parking- Private parking is available in few places at Rs. 100. (I found this is more expensive than parking rate of malls in NCR). If you don't want your car to be scratched or damaged, pay hundred bucks and park it. Do not park on roadside, lest your car should get dents or create traffic mess. Rs 10 coins are not accepted in Mathura/Vrindavan fearing counterfeit/fake currency. Mathura is barely 185 km from Delhi (via Taj Expressway) and the proximity makes it one of the easiest places near NCR to reach. Known for religious/spiritual tourism, Mathura, the birth place of Lord Krishna sees a large number of tourists footfall everyday. The spirit of searching for God is strongly manifested in people. As a believer of Lord Krishna or even as a non believer, you ought to go in a state of trans in Mathura, imbibing the positive vibes and beauty of life. The second half of the day we spent in Sri Krishna Janmbhoomi Temple, the place where Krishna was born. 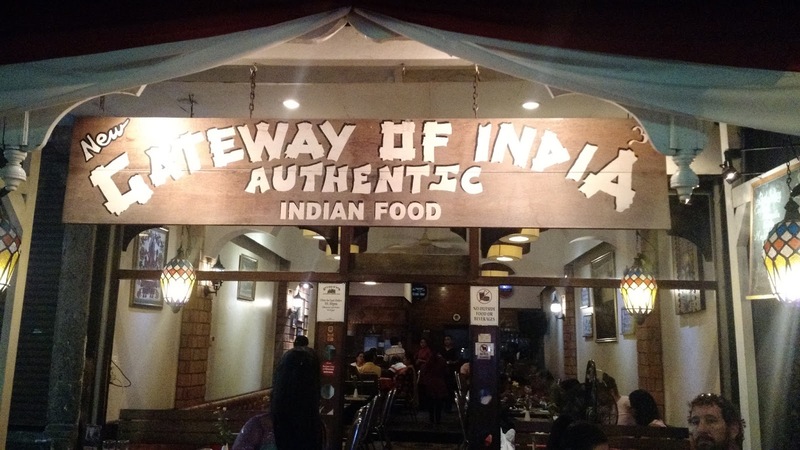 The surrounding place has exciting eating joints that give you a slice of UP life. Stay tuned to know more. By Road: Take Noida Expressway for a smooth uninterrupted journey. The highway is good with thankfully no potholes or repair work. PS. This trip of mine to Mathura was in Jan 2018. Also this post made it to the top post on Indiblogger.